I have been traveling to Britain since 1978. While I love the entire country, Scotland is particularly special to me. Here you will find some of my artworks inspired by my travels in the U.K.
"Sutherland Beach" Watercolor 5 1/6 " x 8 1/8"
A few seals ran from the beach when I approached a "Sutherland Beach" near Durness, Scotland. One kept her head above the water and watched me from a distance for a while. "View from Le Coupée, Sark" Watercolor 9" x 12"
Today, cars are banned from Sark, an island in the English Channel, so visitors must get around by bicycle, horse-drawn carriage, or on foot. This helps preserve Sark's ecology and the peaceful feeling of another time. "Near Benbecula Causeway" Oil 5" x 7"
In the painting, "Near Benbecula Causeway", between South Uist and Benbecula in the Outer Hebrides of Scotland, the tide is out. Before the causeways were built, crossings might cautiously be made on foot during low tide or by boat when the tide was in. 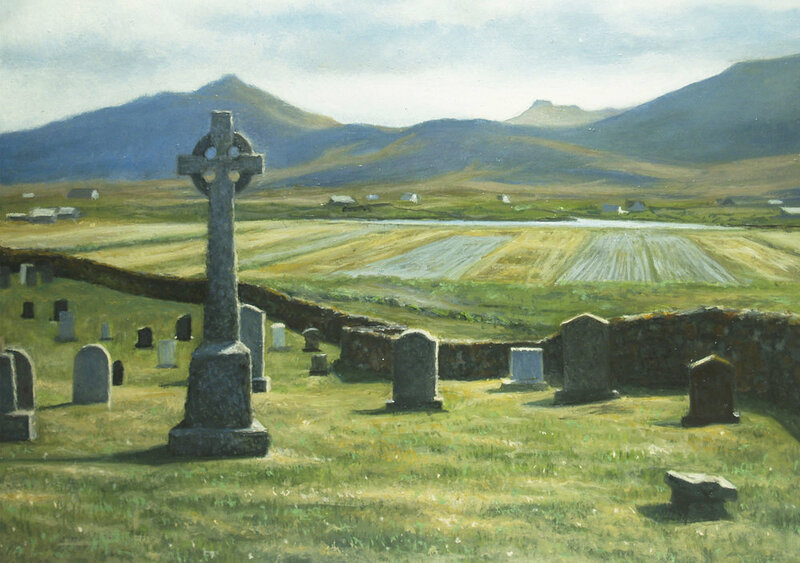 "St. Michael's Cemetery" Oil 5" x 7"
"St. Michael's Cemetery" is on the west side of South Uist. This and two or three other cemeteries I know of in the Uists are still in active use. There are also some very old burials at the ruins of Trinity Temple, North Uist. 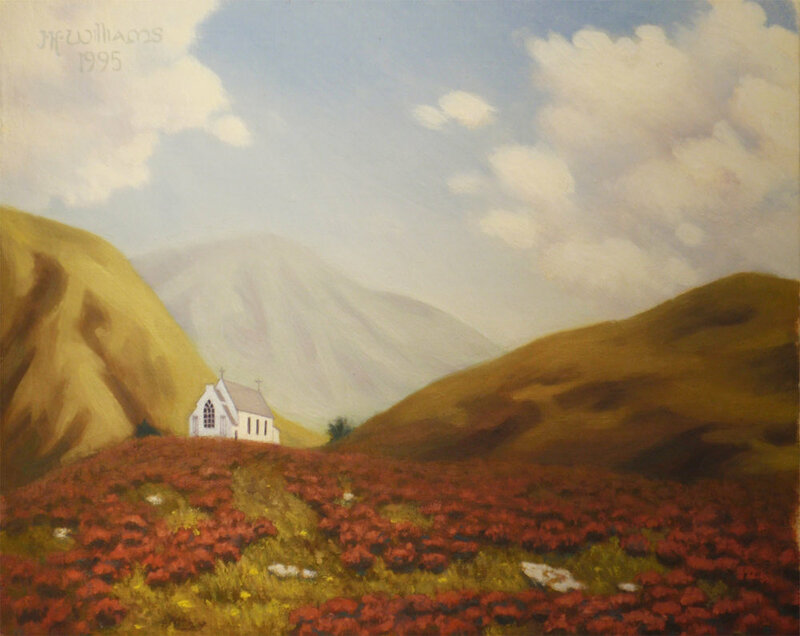 In the distance in this painting you can see tilled fields, farm buildings, and some of the mountains on the eastern side of South Uist. 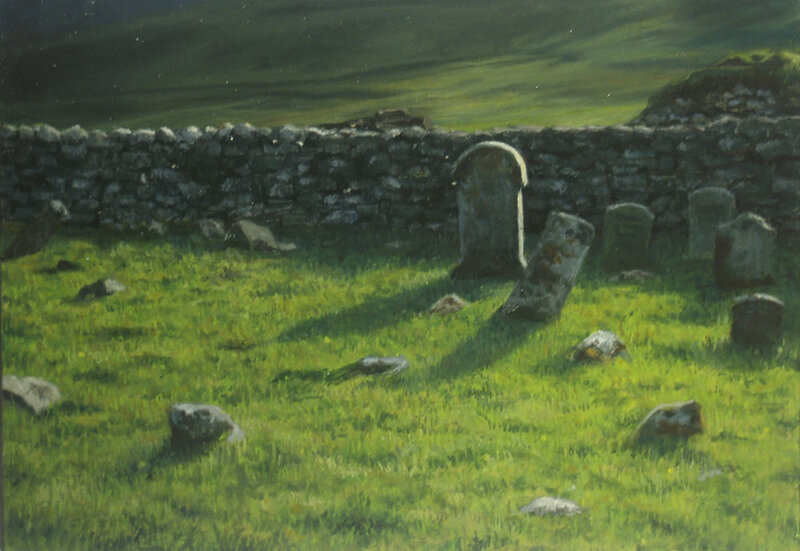 "Standing Stone Near St. Michael's Cemetery" Oil 5" x 7"
"Standing Stone Near St. Michael's Cemetery" is a depiction of a single standing stone on the island of South Uist in the Outer Hebrides of Scotland. The Callanish stone circle on the Isle of Lewis is the second largest circle, after England's Stonehenge. "The Stacs, St. Kilda" Oil 5"x 7"
"The Stacs, St. Kilda"is one of my favorite pictures. Although St. Kilda is part of Britain, I love St. Kilda so much I also gave it it's own section on my website. Go to St. Kilda to see more paintings and some information about this archipelago in the North Atlantic. "Clouds, South Uist" Oil 5" x 7"
The sky in "Clouds, South Uist" depicts the dark shadows cast on the ground by clouds on a semi-sunny day. On days when the sky is partly cloudy yet rainy in spots, it is not unusual to see one or even two rainbows at a time. Scottish weather is predictably unpredictable. There's an apt saying in Scotland: "There's nay sich thing as bad wither in Scotland, only inappropriate clothing!" "Castle Ormicleit" Oil 5" x 7"
Castle Ormicleit is the ruins of an early 18th century mansion built by a chief of Clanranald. Today it is unsafe to enter and starlings can often be seen lined up along the crest of what is left of a roof. "St. Kilda Cemetery" Oil 5"x 7"
"St. Kilda Cemetery" appears in this section along with "The Stacs, St. Kilda" because they are two of my favorite paintings of places in Britain. See more under St. Kilda. "Croft House Window" Watercolor 14 1/2" x 11 1/4"
This traditional thatched cottage in "Croft House Window", is the Croft House Museum in Shetland. Thatching doesn't rot due to the wet weather because of the wind. To help secure the thatching, a large rope net is thrown over the thatched roof and is weighted in place with stones. A thatched roof will last a couple of decades. "Eigg Afternoon" Watercolor 5"x 8"
"Eigg Afternoon" shows one view of an island in the Inner Hebrides that feels very isolated. There are "singing sands" on the island, which create a humming sound due to friction between grains of sand. "Heather Field" Watercolor 6" x 8"
I came across this lovely "Heather Field" at the Highland Wildlife Park in the Scottish Highlands. Heather is invasive and has very tough branches, so you need a good, sharp knife to hack off a piece of heather! 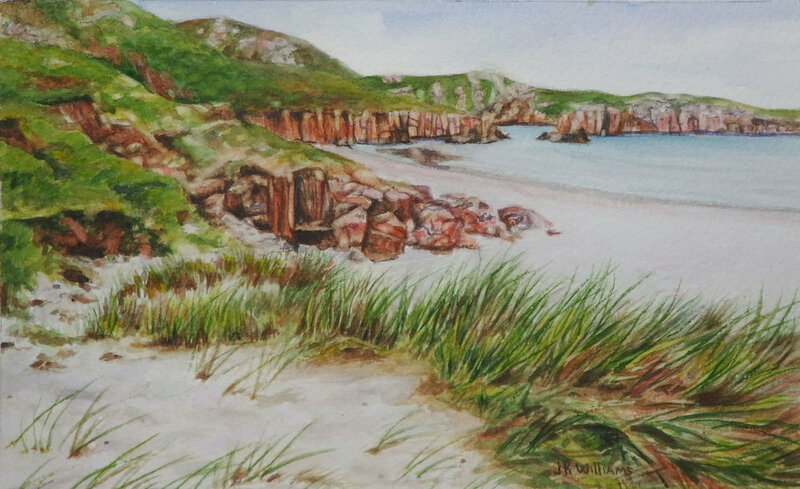 "Near a Sutherland Beach" Watercolor 6" x 8"
The far northern area of Scotland called Sutherland was not named for it's geographical location but for a family with the last name of Sutherland. Much of Sutherland is barren enough that it reminded me to some extent of some parts of the Outer Hebrides. 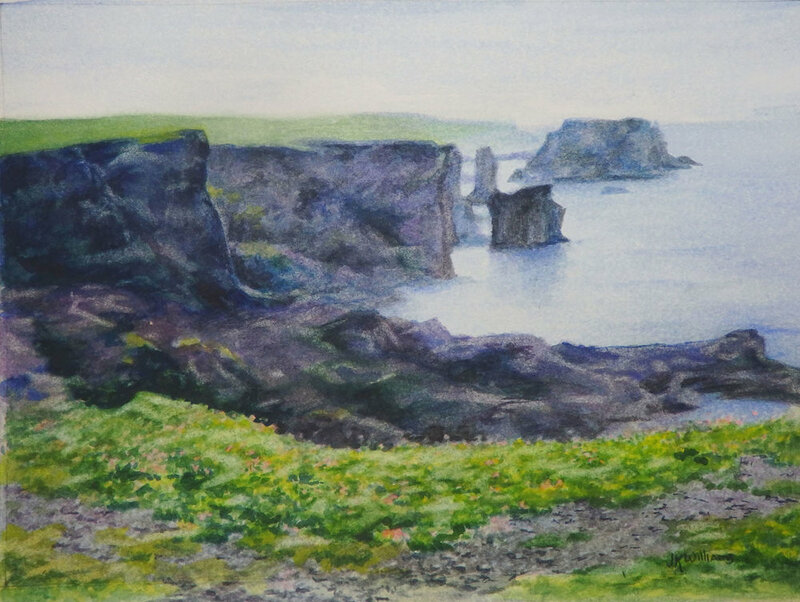 "Esha Ness, Shetland" Watercolor 6" x 8"
I visited Shetland in 1993, the year after a huge oil spill in the North Sea. Here at "Esha Ness", the waves can be so violent that they can hurl pieces of volcanic rock weighing tons from the water's edge up onto the cliffs above. Shetland is part of Scotland today, though their native language was derived from Old Norse. "Highland Heather" Monotype 4" x 5 7/8"
This monotype was inspired by the same scene as the watercolor "Highland Heather". The absence of rich color means the picture focuses almost exclusively on the rich textures of the plants. "Machair Beach, North Uist" Oil 5" x 7"
In the Outer Hebrides of Scotland, the thick sands by the beaches where many types of weeds, wildflowers and tall grasses grow are called the machair. In the Uists, machair grasses are about knee high, while the beach grasses behind the airport on Barra are around a yard tall. One July I took a walk to the Baleshare machair that ended with sleet freezing my trouser legs to the back of my socks! 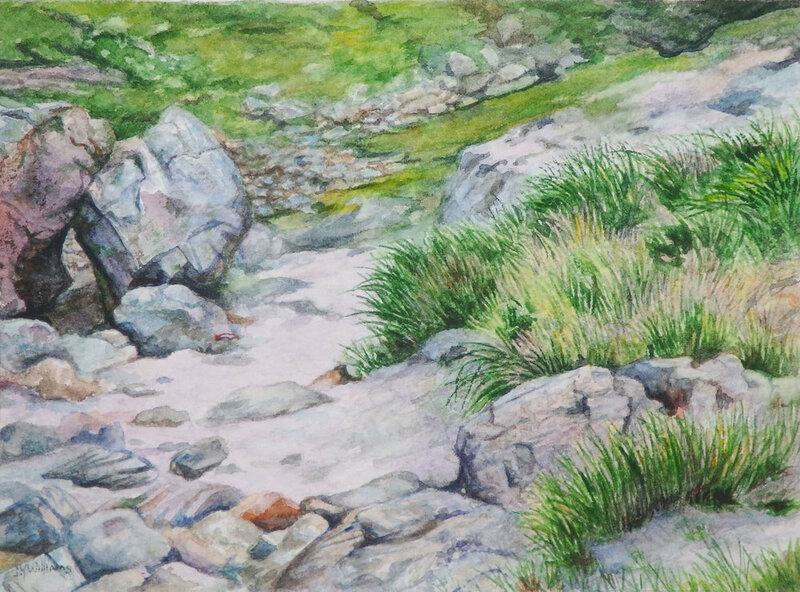 "Soggy Burn" Watercolor 6" x 8"
A "burn" is a Scotch-English word that means "stream" or "brook". This burn is in the Highland Wildlife Park, in Scotland." "Ben Eaval, a Good Day" Oil 5" x 7"
"Ben Eaval, Cloudy Day" Oil 5" x 7"
"Ben Eaval"is the highest mountain on North Uist and can be seen from any area of the island where the view is not obscured by a rise in the land. On rare sunny days, flounders sometimes come up into the shallows here at North Ford to doze in the sun. "Eucalyptus and Bracken" Watercolor 8" x 10"
"Eucalyptus and Bracken" seemed oddly paired in this scene in Crarae Gardens, as eucalyptus trees are not native to Britain. Crarae Gardens is in southwestern Scotland not too far from the island of Mull and Loch Lomond. This painting also appears in Trees Mostly. 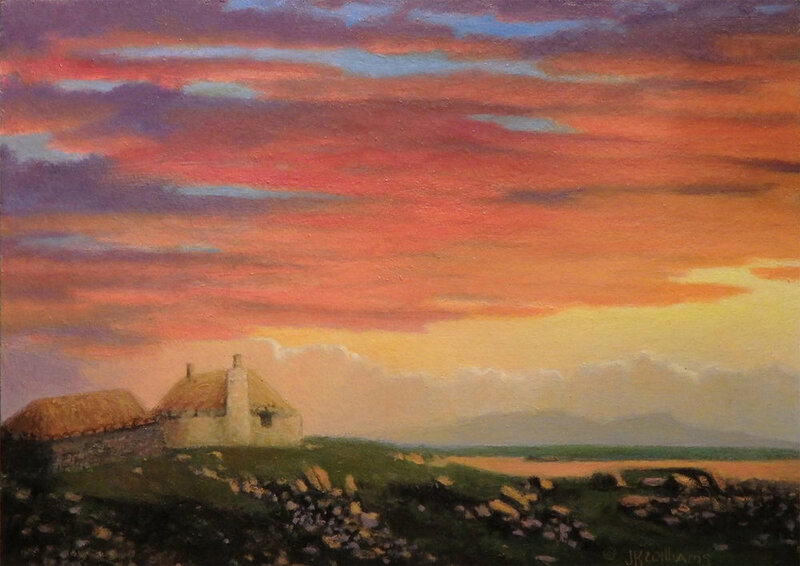 "Sunset by the Ferry House" Oil 5" x 7"
Sunsets in the Outer Hebrides can be spectacular due to the variety of heavy cloud formations fostered by the moisture that rises from the sea. The building shown in "Sunset by the Ferry House" was once the home of a ferryman who transported people between the islands of Baleshare and North Uist proper before a causeway was constructed between the two islands. "Rushes, Inverness, Scotland" Oil 5" x 7"
I worked on "Rushes" on site in a pouring rain and later in my studio in Brooklyn. The rain was so heavy at times that I ended the day soaked in spite of holding an umbrella overhead when the drizzle became a downpour. "Highland Church, Storm Approaching" Oil 8"x 10"
"Highland Church, Fair Weather" Oil 8"x 10"
"Highland Church, Evening" Oil 8" x 10"
"Highland Church by Moonlight" Oil 8"x 10"
These four paintings of a Highland Church are studies of the same scene along the West Highalnd rail line under different weather and light conditions. Old churches such as this are often converted to homes or commercial use when they no longer serve as churches. All rights to images and text are reserved by the artist.